I am SUPER excited to have local Milwaukee artist, Kamryn Kay Boelk, from Permanent Baggage sharing some amazing stuff with us today. I stumbled across Kamryn Kay’s handmade bags last summer at a local Gallery Night and have been coveting them ever since. Besides being stylish and one-of-a-kind, all her bags are made with 98% repurposed or recycled materials. Today, one lucky winner will snag an Eco Chic wristlet of their choice from her Etsy shop! Read on for more about what inspires Kamryn Kay and directions on how to enter! a. Give us your one minute bio. Born in the small town of Oakfield, WI, I was raised by a hard working farm family who instilled the importance of a good work ethic, value of a job well done, and encouraged my interest in art and learning. After attending the University of Wisconsin Fond du Lac and then graduating from the Milwaukee Institute of Art and Design, I began my business, Permanent Baggage, a line of eco-friendly handbags and accessories. b. What made you decide to start your own business and how did you get it going? Permanent Baggage began as a public art project my senior year at MIAD. The intention was to create awareness about overconsumption and its effects on the environment by providing an eco-friendly alternative to plastic grocery bags. The idea was to create a whole bunch of reusable grocery sacks, heap them into a pile in the middle of a public park, and just give them away to people. Sadly, the project never really got off the ground. I quickly realized that creating a ” heaping pile” took a whole heap of time! But there was interest in my bags, and the mission behind it, so I continued to dabble in the venture. Turning Permanent Baggage into a business has been a slow build. After school I worked a full-time job that wasn’t very fulfilling but paid the bills and allowed me to make my bags on the side. They evolved from reusable grocery sacks to haute eco-friendly handbags and I started getting into art shows and consignment boutiques. When the recession hit, I found myself unemployed so I made more bags, applied to more art shows, and set up an Etsy shop. After months of endless job applications and unsuccessful interviews, I was feeling pretty discouraged about finding “work”. Then one day I decided to give up trying to find a crutch job that would be there just in case I didn’t have the guts to see this through and I took the leap of faith. I met up with Mary Gordon – a fantastic local graphic designer who helped me with my branding, organized my mission statement, legally organized Permanent Baggage into an L.L.C., and set to work. I’m now in seven consignment locations, display at numerous fairs through out the year, have an online shop, and plans to grow! 1. Nature – I’m deeply inspired by and have a great respect for nature. I think because of the bags’ repurposed nature they inherently give props to the earth but I also try to sneak it in through their titles or embellishments. 2. The Artist Lifestyle – I’m driven by the desire to live an artist’s lifestyle – the freedom and joy of being able to do what you love. 3. Repurposed Materials – I’m always working with something new and exciting, whether a fantastic piece of vintage French lace, a gritty gray jumper from the 80’s, or cobalt blue leather scraps. Color, texture, and story are my great loves and the constant change of materials keeps my work fresh and interesting. d. What’s in your tool kit? 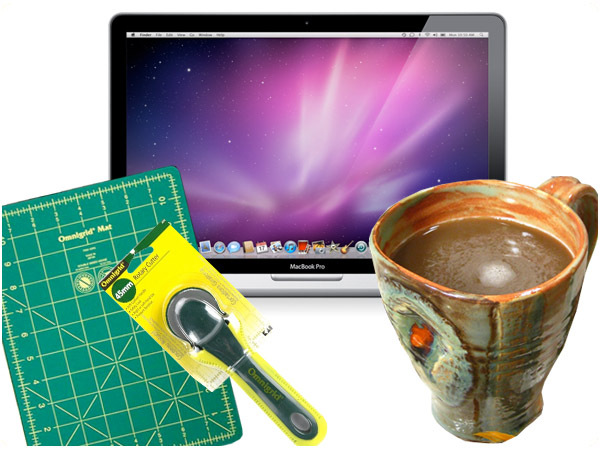 My number one tool is my MacBook! Whether answering emails, listening to music, or editing photos, it’s next to me 90% of the time. I couldn’t live without my favorite coffee mug by Jessie Schroeder-Voss. And also my Omni-Grid and rotary cutter – nothing like a good precise cut. e. What other DIY/crafty things do you do? I made handmade paper boxes for Atomic Chocolates, a local chocolate artisan. I made molds to cast the paper pulp into so I could easily fold and assemble the boxes without doing a lot of cutting. The hand-molded dried paper was embellished with sewing stitches, lace, satin, bows, and a card. They were these perfect little packages. I really enjoyed making them and the delicious rewards. To enter, simply check out the Permanent Baggage Etsy shop and then leave a comment here telling us which wristlet is your favorite. We’ll select a winner at random on Friday. Good luck! Wow, these are super cute! I really enjoy the bags and would love one 🙂 My favorite is the OH HAPPY BAG Eco Chic Wristlet-Manatee. They are all very cute though and I would love any of them! They are all adorable: it’s hard to pick just one! Would have to go with the CanBerry Patch Wristlet. Great giveaway! Too many choices I love these! If I had to pick I would choose deeper purpose or Polly or Vintage flowerbee. I love those! My favorite is the Eco Chic Wristlet Sprig! So cute!!! These would work great as a traveling makeup bag too! My fave is the grey and fuchsia! oh happy bag in maize. gorgeous color. the wristlets are adorable – thanks for highlighting! Sooo cute! And I love that these wristlets are by a local artist. I love the Oh Happy Bag – I’ve been a little obsessed with the yellow and gray motif lately, and it is so cute and so chic. Love it! My favorite is the Wristlet Sprig. ( http://www.etsy.com/listing/67867083/eco-chic-wristlet-sprig) It just looks so fresh and inviting! I really appreciate her love for the earth also. I love the Oh Happy Bag in Manatee. So gorgeous! Loving that gray and fuschia number! Have to go with the Maize….love the colors. I am in love with the Sprig Wristlet. It is so adorable! I like the OH HAPPY BAG Eco Chic Wristlet in Maize. It reminds me of summer! I love the FlowerBee wristlet – so sunny and cheerful! I think the VitaPlaid is beautiful – and the description of it is just as beautiful: “the applique is intended to represent a progression, growth, or evolution.” Just like our life here on earth! My fave is the Flowerbee! I love the OH HAPPY BAG Eco Chic Wristlet-Maize, but it’s hard to just pick one … they’re all so beautiful. My favourite wristlet is the OH HAPPY BAG Eco Chic Wristlet-Maize! I love the detail! I love the eco chic wristlet – deeper purpose. Love them all really! I love these wristlets. I bought one for a friend for Christmas and loved it so much I almost kept it for myself. The new Eco Chic Wristlet Sprig that she is offering is adorable. So cute and makes me wish spring/summer were already here just seeing it. Oh how can I choose?? Since spring and summer are right around the corner, I need something bright! I choose the OH HAPPY BAG Eco Chic Wristlet-Maize. My fave is the Damsel – I have the perfect dress to go with it! Eco Sprig is all me! LOVE this! Great work! Oh Happy Bag in Eco chic! Love the colors, love the bangle bracelet wristlet. Buy Local! Deeper Purpose is fantastic! Please choose me. Eco Chic Wristlet Sprig reminds me of SPRING! Bring on the sandals and tanks and sunglasses! This green wristlet will fit in perfectly! Eco Chic Wristlet Spring!!!! Being on GREEN GRASS!!!! and say goodbye to all this white!!! I LOVE these bags and had one on my Christmas list thanks to your gift giving guide. My favorite- OH HAPPY BAG Eco Chic Wristlet-Maize. 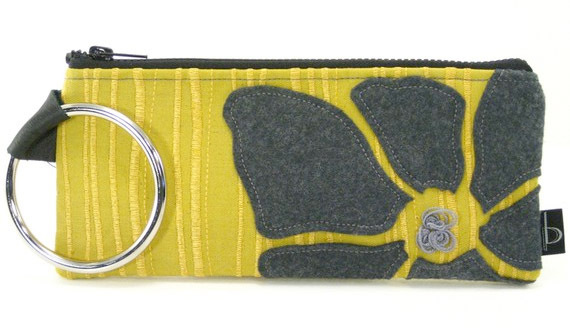 I love the Eco Chic Wristlet Vintage Flowerbee… its perfect for a spring/summer wristlet! Love the Eco Chic Wristlet Sprig. Anything green almost automatically becomes my fave! I really Like the Oh Happy Bag Eco Chic wristlet in the Limelightgrey. It is appealing because it is such a happy color and quite different. I love OH HAPPY BAG Eco Chic Wristlet greyandfuchsia. Anything with pink/fuschsia is my favorite!!! I love the vintage flowerbee!! Super cute bags! WOW! What wonderful designs….so many pretty ones it is hard to choose. But, i would have to say that my all time favorite would be the Damsel. I love bright colors, which makes the gray and fuchsia my choice. They’re all very cute. How cute are these?!? Ahhhh, I want one!!! It is hard to choose a favorite, but I am going to have to go with the rainbow stripe wristlet. Super fun!!!! OH HAPPY BAG Eco Chic Wristlet-Maize . I am so into yellow right now! IF I had to pick a fav (and that is a BIG “IF”! ), I would have to choose the grey and fucshia Wristlet. They are all too adorable! Deeper Purpose would have to be 1st choice since purple is my favorite color. Vintage Flower Bee is a close 2nd…love the bling! Thanks for the contest…hope I win! I would choose the Damsel. The fabric is beautiful. Who knew how beautiful repurposing could be? These are all super cute! I love The Flowerbee Eco Chic Wristlet. Eco Chic peacockandgrey is SO cute! OH HAPPY BAG Eco Chic Wristlet in Maize (the same one you featured) is definitely my favorite! I cannot get enough of that green/golden mustard color this winter. How cute are these wristlets? AND eco friendly? Hurrah! My favorite is the Oh Happy Bag Eco Chic Wristlet in Twilight. Dark enough for night, but still interesting! I love the Vintage Flowerbee. So cute!! The lime green wristlet is my favorite – nice and bright to liven up a dreary Feb. day! They’re all so cute, but I think I like the OH HAPPY BAG eco chic wristlet (pictured above) the most! Hard to pick just one but I like the Wristlet in Glacial Melt. I love the Vintage Flowerbee! What great designs. I especially like the Eco chic wristlet in Sprig. I love the Oh Happy Bag in Maize! the color combo is amazing. Kamryn you are doing an awesome job! I love them all! Especially the Oh Happy Bag in grey and fuschia :). I would love to show it off around the Oakfield area!! I love all of Kamryn’s work and own one of her wristlets! I’m always getting compliments on it! My current favorite is the Eco Chic Wristlet Barneveld because it will go with everything! Eco Chic Wristlet Sprig is my favorite! Great colors! oh happy bag in gray and fuschia is my favorite. i met kamryn at an arts festival in watertown this summer. her designs are super-cute, super-fashionable, AND eco-friendly. Its so hard to chose, but I think these two are my fav! They are all so cute! With snow still falling, and the ice not thawing, thoughts of spring warm the heart and mind. What better wristlet than the one aptly named sprig, with … wait…. is that a blade of grass I see? Perfect! They are all lovely but my favorite is the Eco Chic Wristlet Glacial Melt. I love these bags!!! I am needing a little warmth & sunshine so my favorite is the OH HAPPY BAG Eco Chic Wristlet greyandfuchsia. I love the green one with grey flower. The wristlet featured is by far my favorite, though I love the asian one too. I love all of them!